Peace of Mind for Parents. Peaceful Sleep for Babies. Available at Walmart & Walmart.com. Stay Connected to What Matters the Most. The MOTOROLA MB483-2 Video Baby Monitor provides parents reassurance that your child is resting peacefully without waking them up. The parent unit shows a view of the baby's room through one of the two cameras and offers a single or split-screen viewing option. There is also a digital zoom function and even two-way communication so you can talk to your baby through the unit. Watch them at night with infrared vision. This digital baby monitor system even plays lullabies to help infants get to sleep. The parent unit works within 1000' of the cameras and gives off an alert to let you know when you get out of range. 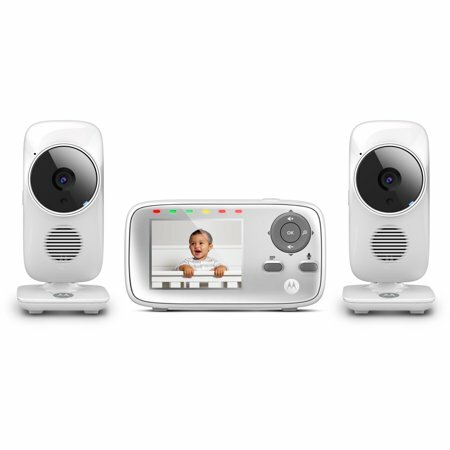 The MOTOROLA MB483-2 video baby monitor picks up noises with the high-sensitivity microphone and shows the sound level with an LED indicator. We really love these cameras!! The power cord does come out somewhat easy, only sometimes when you move it, but that's no big deal. The picture is really good. It's usually in Night Vision when we use it and the picture is still great. It has really neat features. We can play sounds for baby using the camera to ease her to sleep. We haven't used it yet but we can speak to baby through the camera as well. We did test it and the sound comes across very clearly. I especially like the temperature alarm feature. During the winter, I love that it will alert me if it reaches above or below set temps. We did have an issue initially connecting to the cameras but that was user error. If you press the Ok button it switches camera to camera. We weren't aware of this and couldn't see our camera. It's super easy to use and we are so thankful to have it!! My husband bought this monitor last minute to try. We absolutely love it, our son is now 4 months and the picture is so clear, sound is clear, and all the extras are nice too. It's pitch black in his room yet the image looks clear as day to us on the monitor. I love the talk-back option. Not a single negative thing to say about this item! Great baby monitor, clear video even in IR mode. This is the best baby monitor that we got so far. We bought 3 different one on Amazon and ended up return all of them, then we stumbled upon this deal (it went on sale for $58). We absolutely love this monitor, very clear pictures (even with IR mode), Speakers are pretty loud on both the monitor and the cameras itself. This set comes with 2 cameras, but i think the monitor allows you to connect up to 4 cameras. Control are easy, unit is very well made, hard & solid casing (not cheap and flimsy plastic casing like most of them). Battery on the monitor is interchangeable so that's a plus (however, the battery that comes with it can only work for about 2 hours max on a full charge). Overall, at the price that we paid, it was an amazing deal. purchased this item for my 2 year old and 3 month old. I like the dual camera. we had issues connecting the cameras. both cameras show as camera 3 and 4 instead of camera 1 and 2. so when I wanna watch both cameras its splits the screen by 4's instead of just a split screen. would also liked to have a wider view from camera with a better zoom action. I got this to help with caring for an elderly parent who needs assistance during the night. It has an easy-to-use interface, and I like that only one button is on the outside of the unit so I don't accidentally activate something when I pick it up. Video quality is very good during the day and fair at night. Two-way talk feature and zoom are very helpful. One negative is the volume - even at the lowest volume it can be kind of loud. Can't hear both rooms at same time. I love how I can see both kids in their rooms, but my biggest issue with it is that you can't listen to both rooms at the same time. It makes it difficult at night when I have to choose which room I listen to and which I don't. Why give the option to have more than one camera and not let you hear them all at one time? Especially if we are sleeping, I can only listen to one kid. The volume is super loud, even on low. The camera is great, both at night and during the day. I don't like that the camera doesn't move and I don't like that I can't hook it up to my phone. No. doesn't zoom enough. And, it doesn't move around more than on click. Which means I can't see my elderly clients face with a more detailed zoom or, I can't move from elderly's head to the top of legs. NOT GOOD. Would've sent it back but ran out of time to return it. Biggest issue is the battery in the receiver is garbage, we just started using this monitor and the receiver only lasts a few hours off the charger even without running the video screen, there is no way this monitor would last over night if I didn't keep it plugged in. Today I unplugged it and didn't even turn it on just left it sit for a couple hours and the battery was down to half The other issue is one of the 2 cameras won't stay paired to the device. Worst baby cams i ever came across , soon as you set both cams in spilt veiw it disapears after the cam decides to go piwer save then once its off u gotta repair the split cam over and over and itdont work 98% of the time . So ur only getting one cam to work. Worst of all i charge it off get full charge and it lasts about 10 minsthe longest and you gotta walk around repluging it now ,atter where you go . Only had it a week . And replaced the batteries thinking it was a return . And still dont hold a charge . Going back to vTech . This was a oack of garbage . Sadly nothing good about . Its horrible because this is for a baby . Shouldnt happen this way at all .